Colonial Quaker Edward Hicks taught himself how to paint. His fellow Quakers criticized him for this friviolity, so he tended to the fields, but thankfully retreated to his first love and god-given talent with a brush. He, also a preacher, didn't let god escape, though. 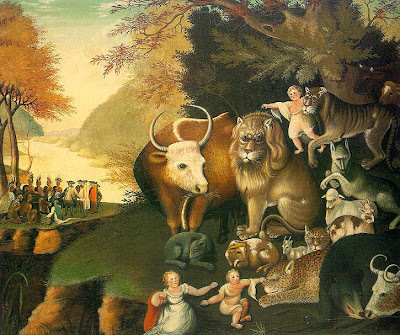 His naturalistic patinings use animal symbolism to convey the qualities of Quakerism. 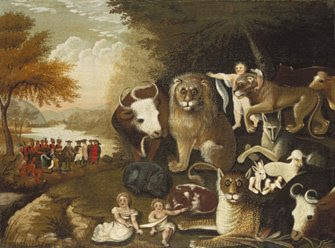 The painting above (c. 1834), filled with aging animals and a great wide sky, was his last of 61 versions of the Peaceable Kingdom. The version below came earlier and currently hangs in the Brooklyn Museum's long-term installation, American Identities: A New Look.